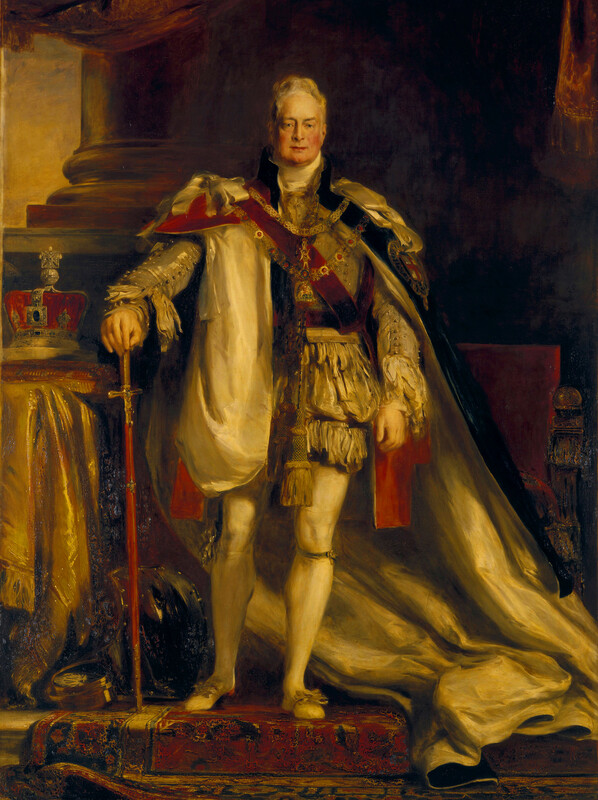 David Wilkie was one of the most successful painters of the Regency period and was greatly encouraged by the Regent. Born in Fife, trained in Edinburgh, Wilkie settled in London in 1805 and began regularly exhibiting at the Royal Academy small scale scenes of everyday life. At this time Dutch and Flemish old master paintings were hugely popular and expensive, as is demonstrated by the works collected at this time by George IV. Wilkie began his career consciously emulated the low-life scenes of Teniers and Ostade, but by the 1820s he had begun to set his sight rather higher, taking Rubens has his model, in particular the fluid and painterly character of Rubens’s oil sketches. Wilkie’s royal career involved succeeding Raeburn as Limner to the King in Scotland in 1823 and Lawrence as Principal Painter in Ordinary to the King in 1830; he remained in these positions until his death, although Queen Victoria disliked his work. This portrait was painted to join the Lawrence full-lengths in the Waterloo Chamber at Windsor Castle, where it was already hanging in 1835. The King is shown in the robes of the Order of the Garter with the collars of the Garter and the Bath and resting his right hand on his sword; the Imperial Crown stands on a table beside him. Wilkie depends more on the old master quotation than most of his contemporaries: the frontal presentation here may be a reference (somewhat half-hearted) to Holbein's famous depiction of Henry VIII (see OM 216, 405750).